Singer Ariana Grande apparently loves photos of Jupiter like this one from NASA's Juno spacecraft. This view was taken on May 19, 2017 and was processed by citizen scientists Gerald Eichstädt and Seán Doran to enhance color differences. Ariana Grande apparently likes giant planets. Specifically, Jupiter and Neptune. The two giant planets caught Grande's eye over the weekend, with the "No Tears Left To Cry" singer spending part of Saturday (May 5) marveling at their beauty on Twitter. She started with Jupiter, the largest planet in our solar system. 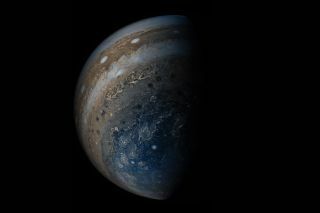 "Nothing is prettier than Jupiter," Grande wrote just after posting a spectacular photo of Jupiter from NASA's Juno spacecraft. We agree that Jupiter is stunning, and the photos from NASA's Juno spacecraft —which are processed by citizen scientists into a kind of otherworldly art —can be jaw-dropping. But it didn't take long for Grande to find a new planetary love. "Update: Neptune is better," the singer wrote less than 2 hours after her Jupiter pronouncement. She posted an iconic photo of Neptune from NASA's Voyager 2 mission as proof. "I'll keep you posted but for now that's that on that," she added later. Grande's planetary preferences did not escape NASA's eye.
" We can’t pick favorites, but we’ve got you--check out the whole solar system at http://solarsystem.nasa.gov," the folks with NASA's Planetary Science Division wrote Grande via their @NASASolarSystem handle. Grande's response to NASA's callout?